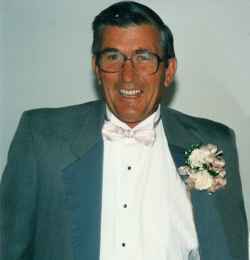 Marshall Evans Sears, 86, passed away peacefully on Monday, March 6th, 2017, with his wife and children by his side. He was born in Sheldon, Vermont on October 25th, 1930, the son of the late Henry Euclid and Ruth E. (Underwood) Sears. Marshall was a 1949 graduate of BFA, St. Albans. He attended UVM and Oxford before enlisting in the US Air Force, stationed in Scotland. He was also a member of the American Legion Green Mountain Post #1. Marshall worked for several companies as a machinist, prior to his 25 year career at IBM. He is survived by his wife of 60 years, Eleanor (Sweeney) Sears and their children; Bonnieta Rae of Swanton, Alan Marshall and his wife Colleen of Swanton, Brenda Jane of S. Burlington, Peter Michael of Georgia, Ricky Mark of Eden Mills, and Betsy Sue of Maui. He is also survived by 8 grandchildren, 10 great-grandchildren, and by many nieces, nephews and cousins. Relatives and friends are invited to attend calling hours on THURSDAY, March 9th, 2017, from 4:00 to 7:00 PM at the Heald Funeral Home, 87 South Main St., St. Albans. A funeral service will be held on SATURDAY, March 11th, 2017, at 11:00 AM at the Georgia Plain Baptist Church, 1493 Stonebridge Road, Georgia, with Pastor Tyler Smith officiating. In lieu of flowers, memorials in Marshall’s name may be made to the Jmmy Center, 1486 Stonebridge Road, Georgia, Vermont 05468. To send Marshall’s family a written expression of sympathy, please go to his on-line guest book at www.healdfuneralhome.com.